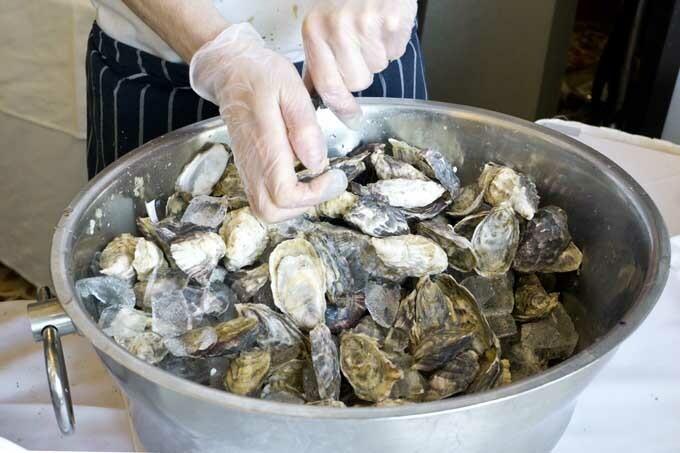 Showcase Restaurant at the Vancouver Marriott Pinnacle Downtown in Coal Harbour is known for their Pacific Northwest cuisine and sustainable seafood. 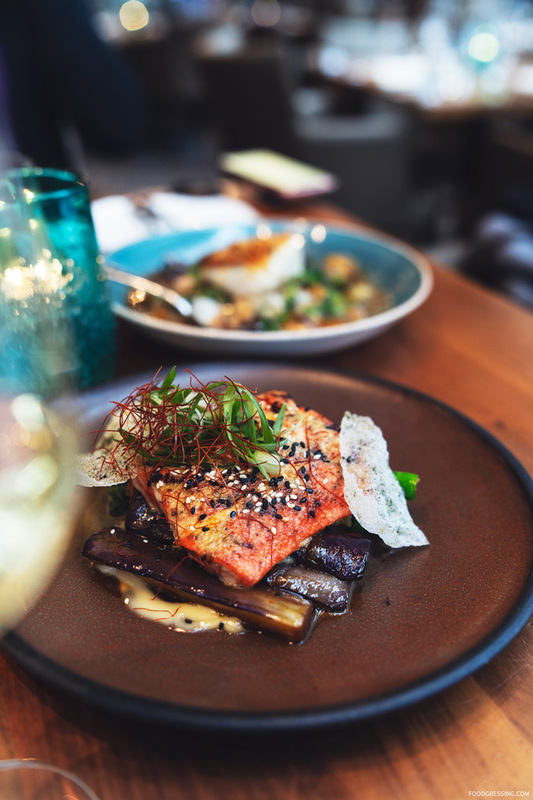 Executive Sous Chef Jesse Hochhause recently invited me for a media tasting where he showcased a few Oceanwise favourites from the menu which also incorporate Asian influences. 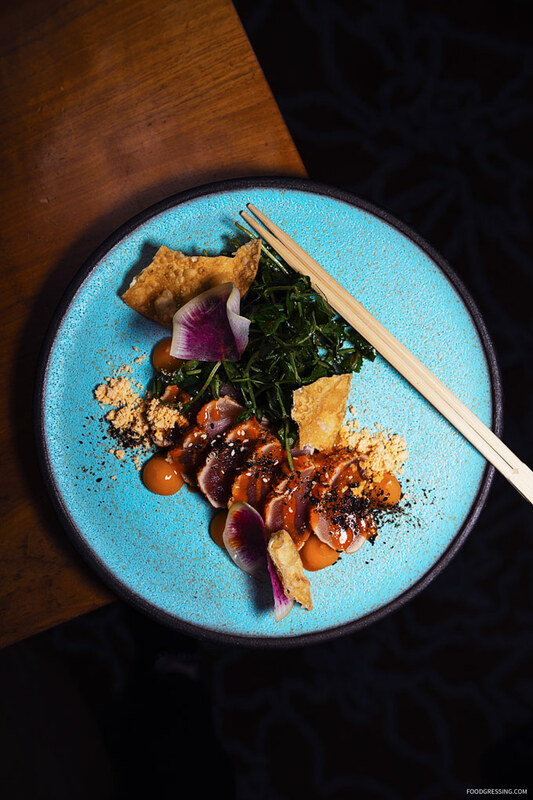 One of Chef Jesse’s favourite starters is the Albacore Tuna Tataki with ginger-soy vinaigrette, mango puree, pea shoots, togarashi, and wonton. In general, I love tuna tataki and Chef Jesse’s elevated version was absolutely delicious with the sweet mango purree and the wontons for a crispy textural contrast. This was presented on a plate created by local ceramics artist Yookyoung Yong. 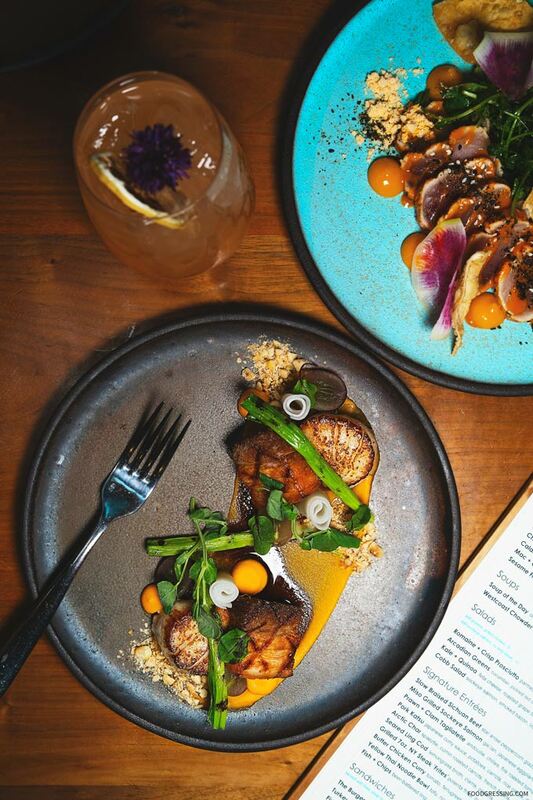 For those who might enjoy a surf & turf type of starter, Showcase has the Seared Scallops + Pork Belly for the best of both worlds. Accompanied with a carrot purée, hazelnuts, grilled scallions, and red grapes. The Miso Grilled Sockeye Salmon was a slightly sweeter entree (up my alley) and came with gai lan, Japanese eggplant, sweet soy, and rice cracker. 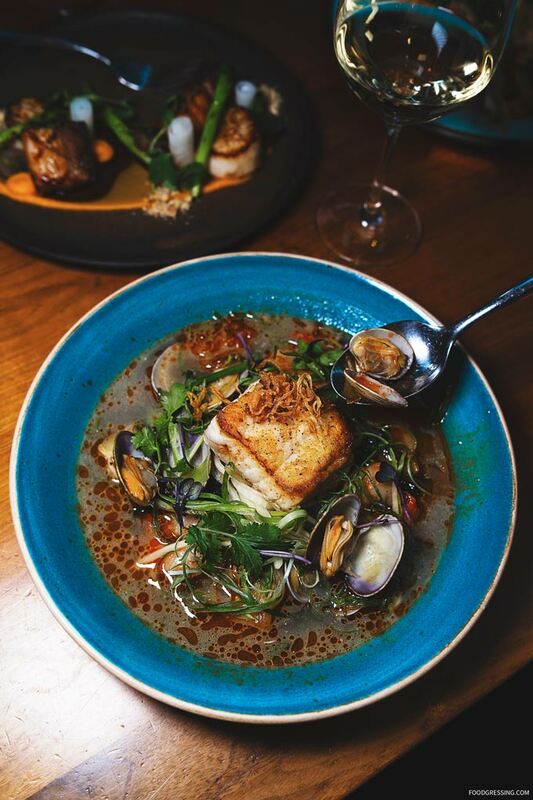 The Seared Ling Cod in lemongrass broth was a comforting, homey type of entree. There were also other types of seafood (clams and prawns) and green papaya, baby bok choy, crispy onions, and chili oil incorporated. To finish off a fantastic meal, the London Fog Cheesecake was so good that I was scraping the plate to the last bit. 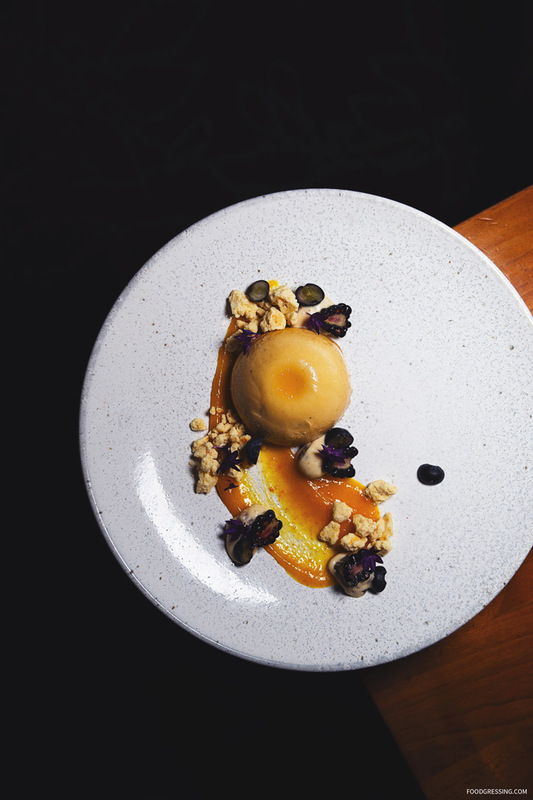 The beautiful and tasty dessert also featured milk crumb, orange marmalade, and maple raisin cream. 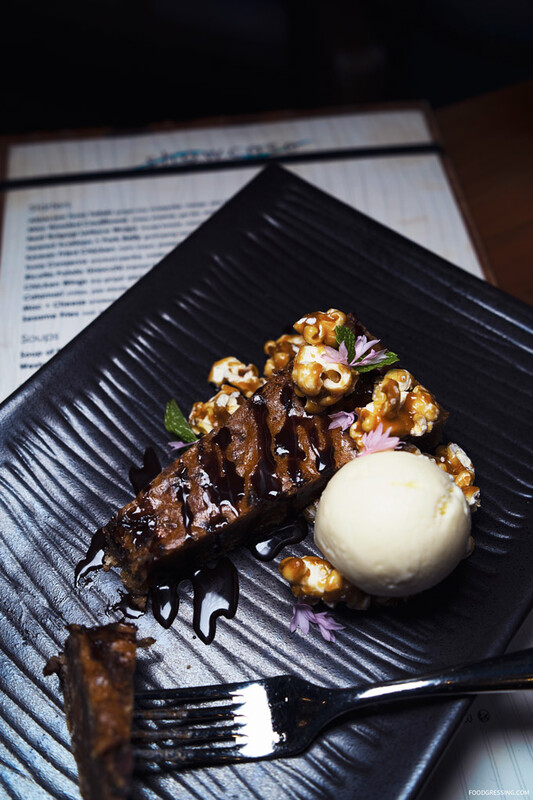 For something a little more decadent, the Chocolate Pecan Tart with oatmeal crust with popcorn ice cream would be a nice way to finish the meal. It had a good balance between chocolate, nutty and caramelly flavours. My ideal 3-course would be Albacore Tuna Tataki, Miso Grilled Sockeye Salmon and London Fog Cheesecake. Showcase Restaurant is open daily from 6:30 am – 10 pm. Visit www.showcaserestaurant.com for more information. Disclaimer: I was provided complimentary tickets to the Fall Harvest Dinner by The Belmont. All opinions are my own. 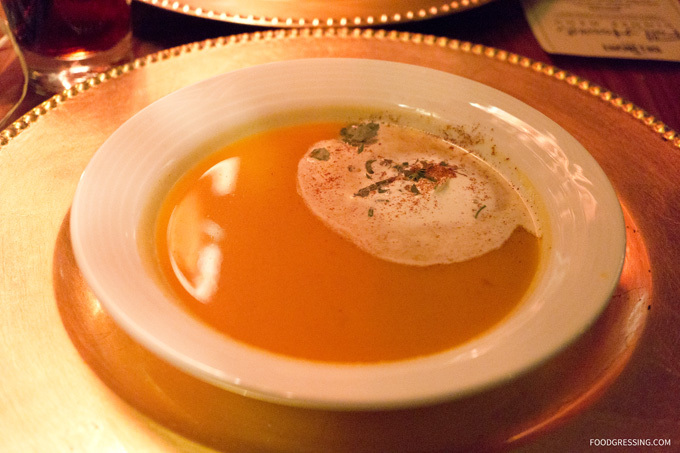 Last week, the Belmont held a 4-course Fall Harvest Dinner which was the 2nd installment of their Drink. Dine. Dance. series to celebrate their one year anniversary. Tickets were available at the special price of $20 (excluding drinks) as a thank you to their customers for a fabulous year of business. 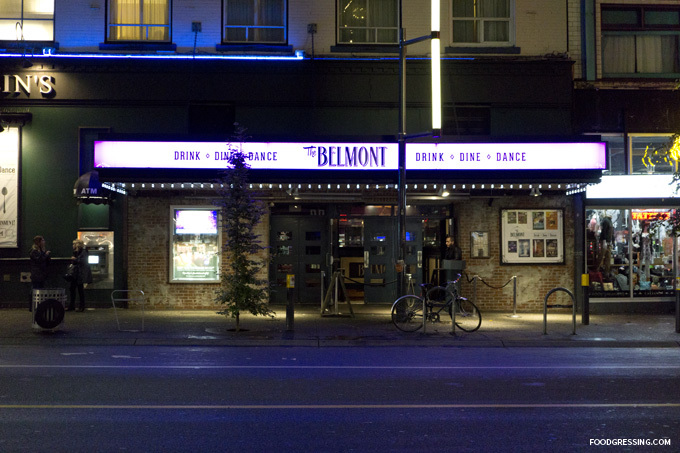 I had never been to The Belmont before and was immediately impressed with their elegant space. The cozy lighting with a mix of red, purple and blue tones set a comfortable mood for the dinner. 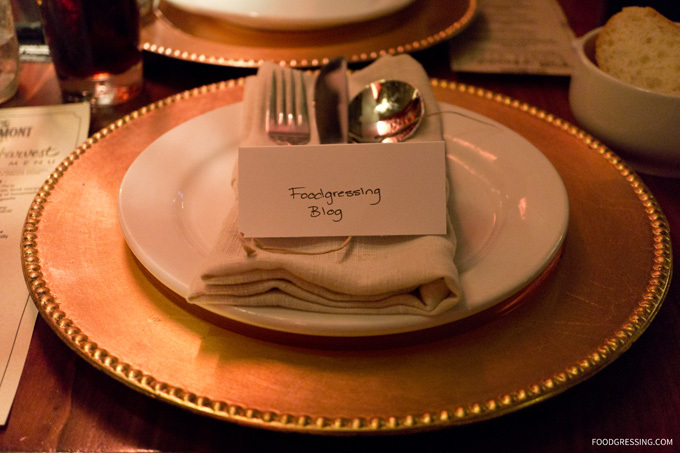 The seating was prearranged and the tables had lovely place settings including a gold charger, a burlap table napkin, and place cards. 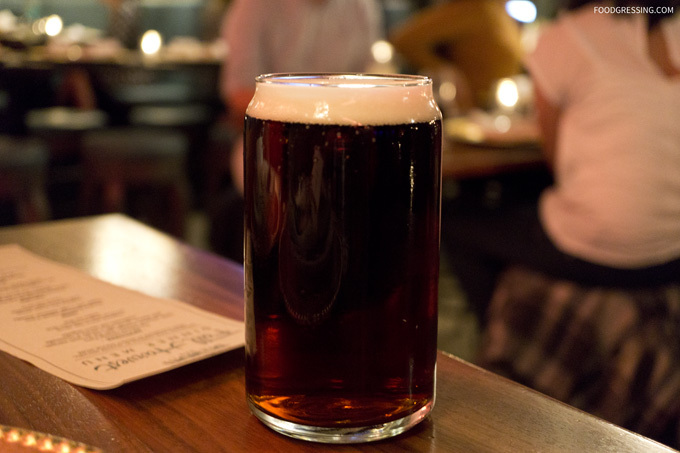 One of the suggested pairings for the dinner was the Doolin’s Ale, which we chose for our drinks. 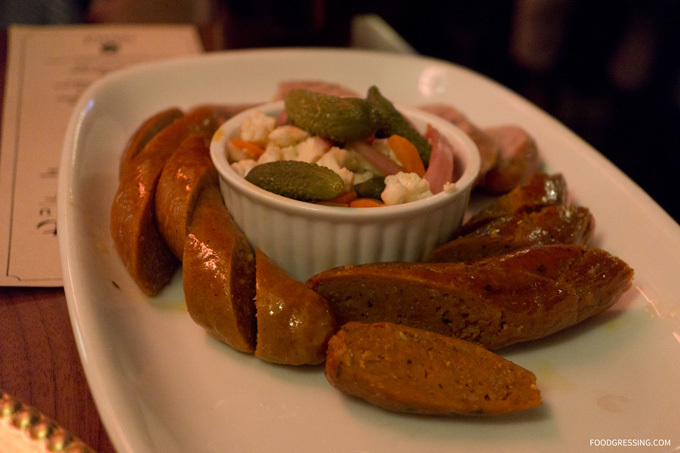 The dinner started out with The Belmont Sausage Party – an appetizer tray of local, artisanal sausages including pork and ale, lamb merguez, and pork chorizo. 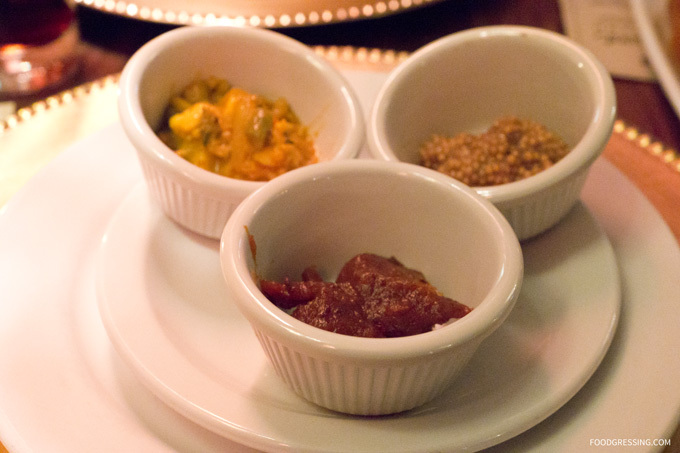 These were served with a variety of house made condiments, pickled vegetables and bread. I was most definitely a fan of the spicy and earthy flavours of the lamb merguez. The next item served was the deliciously rich and creamy roasted butternut squash puree soup topped with a light cinnamon Chantilly. Our entree consisted of prawns provencal and gnocchi. 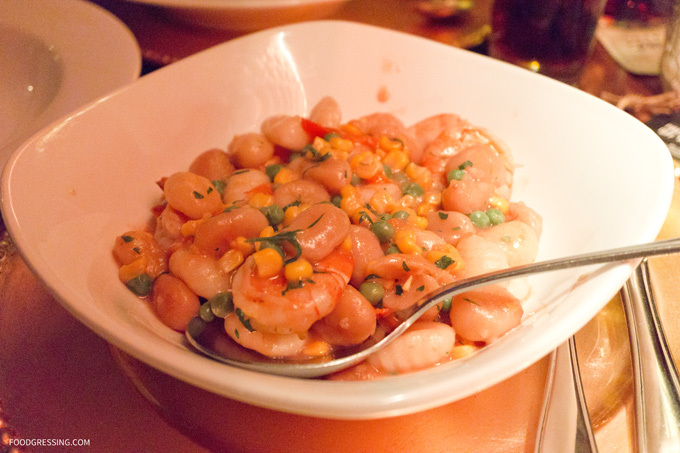 It was a zesty dish with buttery prawns, fall corn and peas, roasted tomatoes and preserved lemon. 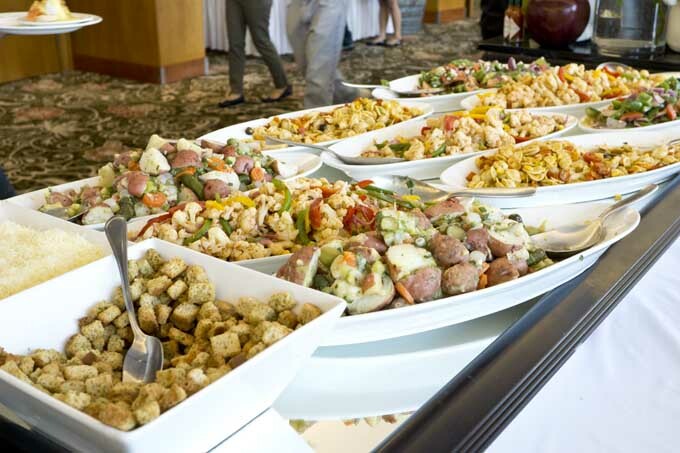 Each table was provided a common dish for the entree and individuals would serve themselves. 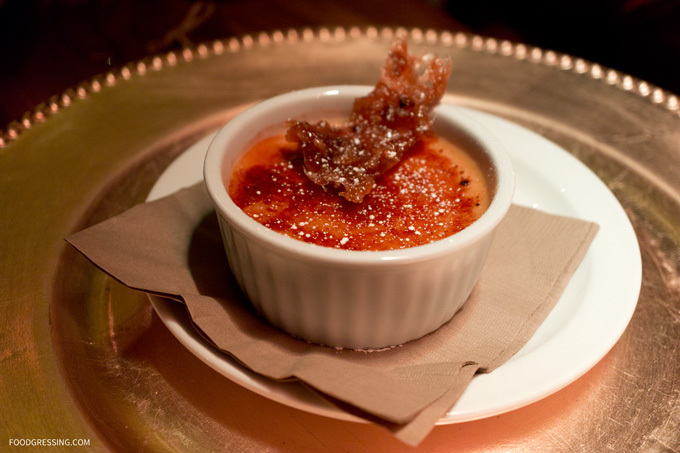 The meal ended off on a high note with a sinfully pleasing spiced pumpkin crème brulee and candied apples. The creamy pumpkin custard was absolutely divine. 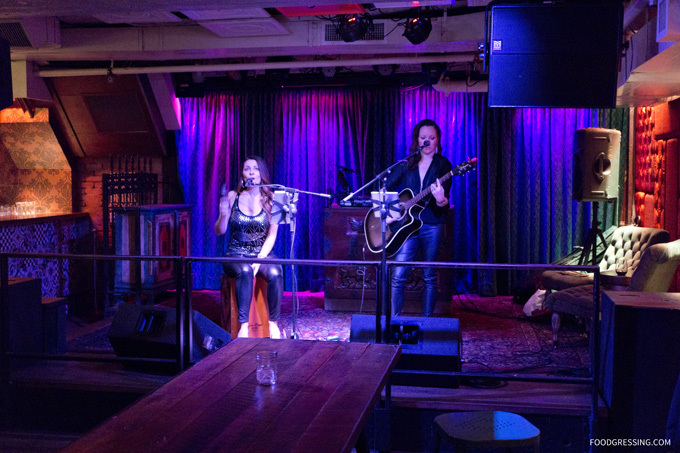 The event was overall very enjoyable from the delicious food to great live music to the friendly staff and servers. For $20 per ticket, the event was definitely worthwile. For more on The Belmont’s Drink. Dine. Dance event series, visit http://www.belmontbar.com or on social media: Facebook, Twitter and Instagram. 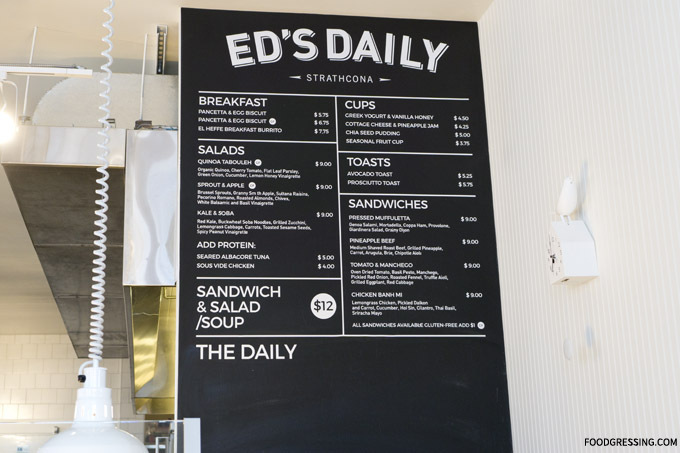 Ed’s Daily is a neighbourhood café and commissary serving grab and go breakfasts and hot lunches in the Strathcona area. I came to know Ed’s Daily last month when I attended the media preview of the “Meet the Makers” expo. Family is at the heart of Ed’s Daily as it is named after two Eds, who are the paternal grand-fathers of the owners. The site of Ed’s Daily has quite an interesting past including once being a hotel and pool parlor. The location had been derelict for years, but is now renovated to accommodate both a 24-seat café and 3,500 square-foot commissary kitchen. The commissary kitchen is part of Ed’s Daily’s commitment towards building community by renting out kitchen space to local food trucks and small businesses. The interior of Ed’s Daily is a bright open space with an open concept kitchen, small dining tables, a wooden banquette and counter top seating. Their menu consists of breakfast biscuits and burritos, yogurt and fruit cups, pastries, toasts, salads, sandwiches, and daily specials that are announced and pictured on social media. 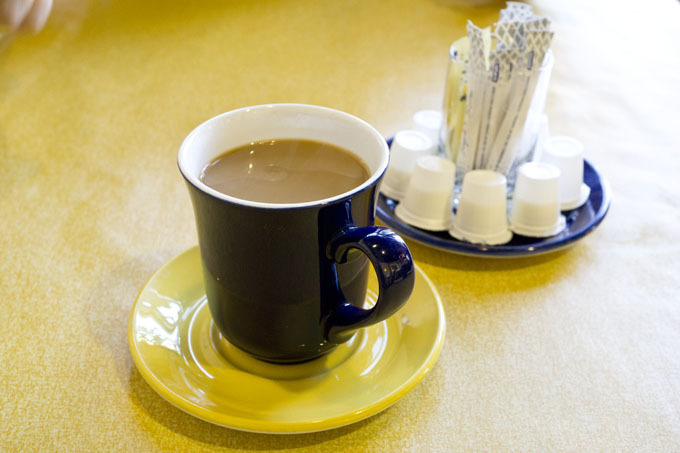 Ed’s Daily also features locally-roasted Matchstick coffee as well as their breads. Food is served on stainless steel cafeteria food trays with a paper liner. 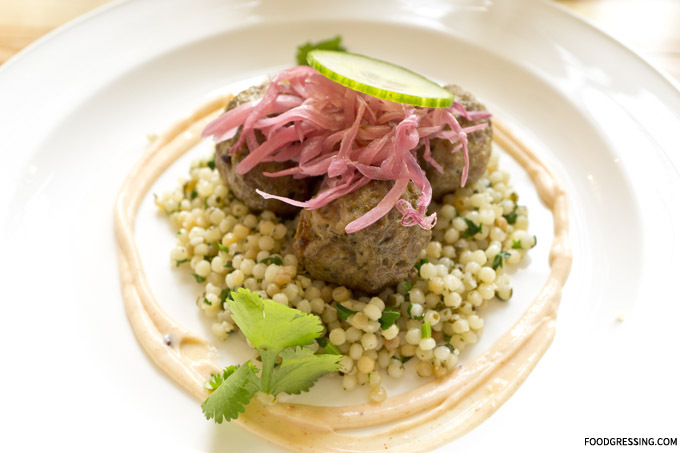 During the media tour, we were treated to the special of the day: a beautifully presented and tasty Peace river lamb meatballs with pesto couscous, harissa yogurt, pickled red onion and cucumber. I liked that it was warm, good, homey and an overall lighter dish. My review of other people’s Instagram posts of Ed’s Daily revealed that the avocado toast ($5.25) and prosciutto toast ($5.75) were popular items. I headed out to their café on a late Friday afternoon to try these breakfast/lunch items. I was in great anticipation as the chef brought out the food tray to my table. The two pieces of toast were larger than I expected. 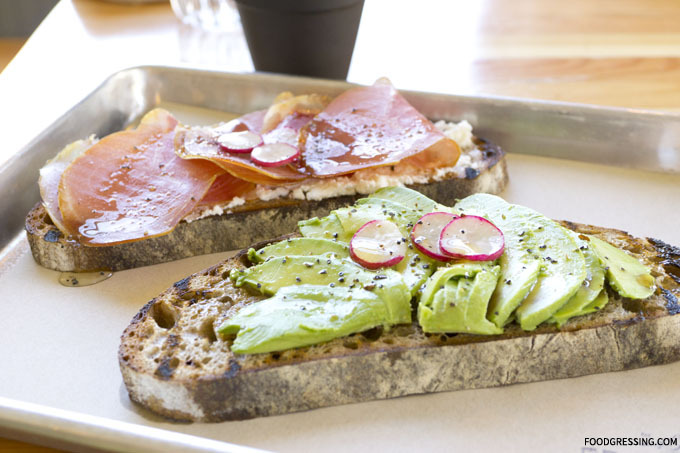 The avocado toast had beautifully sliced avocado pieces on Matchstick rye bread with chili oil, red radish, maldon sea salt, and cracked pepper. The prosciutto toast had a layer of ricotta, honey drizzle, and micro greens atop Matchstick rye. I liked that the prosciutto was not very salty. Both pieces of toasts were delicious, comfy and quite filling (rye bread does that to you). I could not finish my two pieces, and had the rest of it packed up. 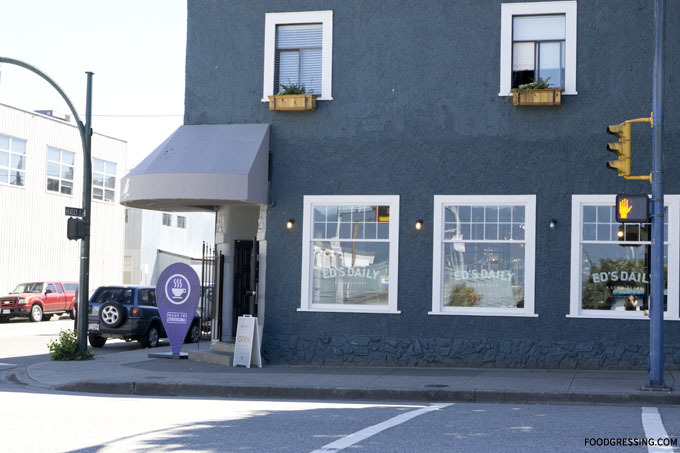 Just a few blocks from the Olympic Skytrain Station is De Dutch Pannekoek House on West 2nd. 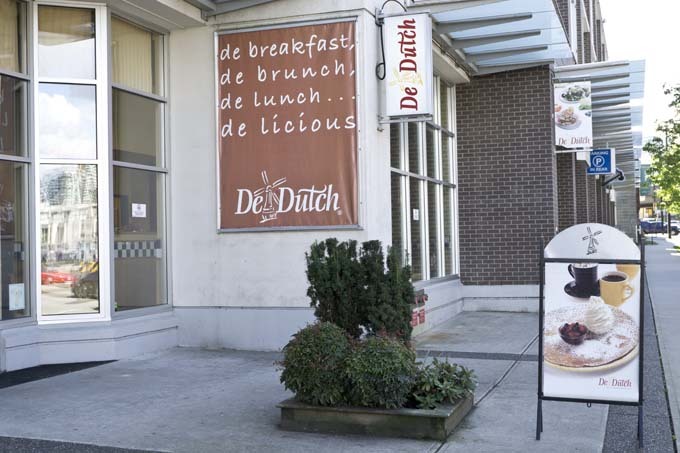 While I have dined at the De Dutch at Coal Harbour a few times, I had never been to this location. I would consider the location a little bit unconventional. It is past the Vancouver Police Department building and a funeral home, across a PetSmart and next to a Starbucks. This particular De Dutch location is, however, very family-friendly. 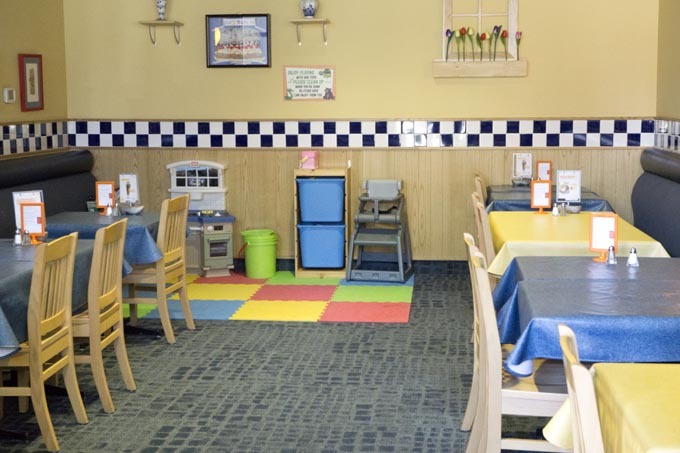 It has separate, smaller dining area with a little play zone with toys for kids. This is really great to help keep kids busy so that parents can enjoy their meal *as much* as they can. The main dining area is clean and bright. I saw on their Facebook page recently that their avocado feature menu was available again for a limited time. One of the items that my husband and I ordered was the avocado, deBakon and tomato Bene ($14.25). Instead of egg muffins, this dish had Dutch rusks. It provided an interesting texture since it felt more like dry, toasted bread. This dish came with hashbrowns and fresh fruit, which were standard in taste. 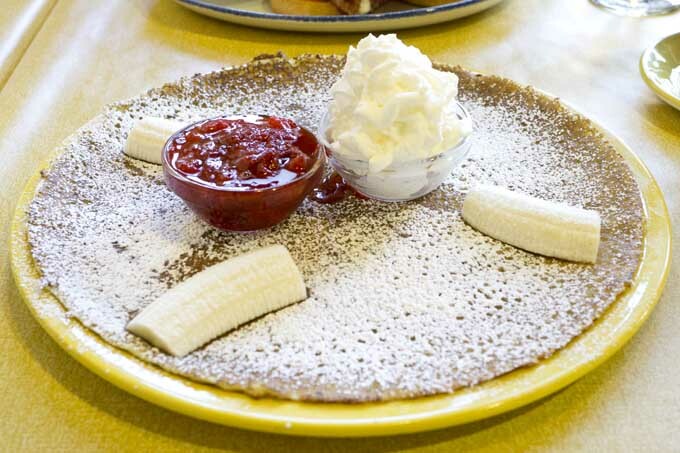 The De Dutch pannekoek (or simply *pancake*) is the signature menu item. With a circumference of 37” and a diameter of 12,” it is essentially one extremely large crepe. Offered in both sweet and savoury varieties, the pannekoek recipe is *top secret* since De Dutch first opened in 1975. We had the banana, strawberry and whip pannekoek ($13.50). Having tried a few De Dutch pannekoeken before, I noticed that the pannekoek can be be inconsistent. I have had it be too dense, soggy, and greasy before. This time, however, the pannekoek was just right – not greasy or burnt and light. The banana, strawberries and whip cream were fresh; it is hard to go wrong with this combo. The most underwhelming part of the meal was the coffee. It tasted really bitter. 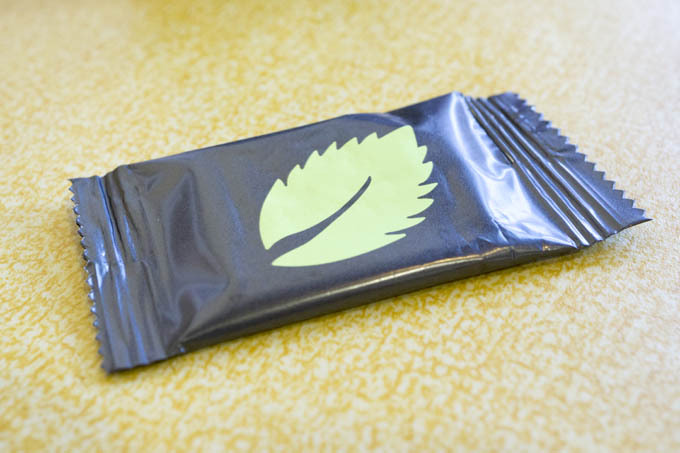 We received a mint chocolate at the end of the meal. I also am a member of the De Club rewards program. You pay a one-time $5 membership fee, but you get a $10 gift certificate afterwards. You earn 1 point for every dollar you send. For every 125 points, you get a $10 reward certificate. I was able to apply the $10 reward certificate for this meal without any issue. The server was not in the cheeriest of moods, but she did her job. She took orders, checked on us, refilled the coffee and got the bill in a somewhat timely manner considering she was the only server. There was no one to greet me at the door when we arrived, so we ending up waiting a bit for the server to seat us. What I liked about this De Dutch location on West 2nd is that it is family-friendly with the kids’ play area. 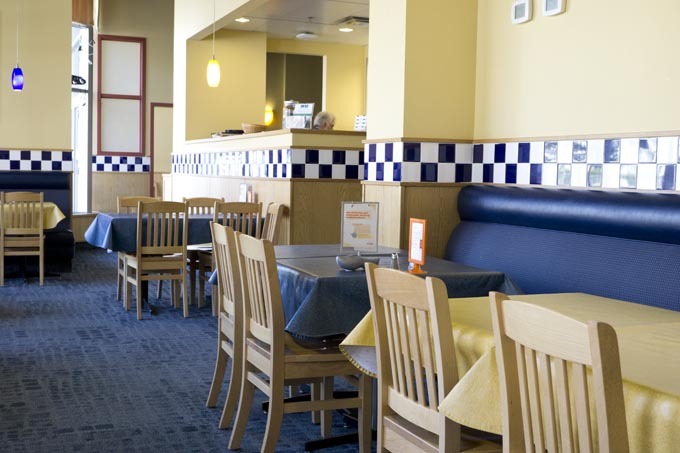 It is hard to find a restaurant that would offer valuable space to accommodate kids. 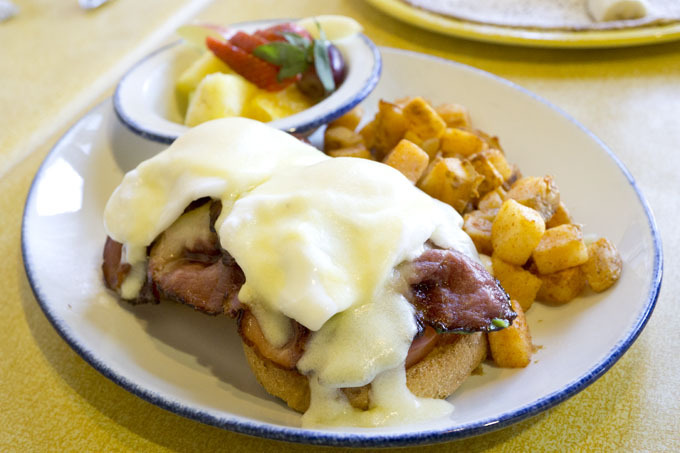 In general, De Dutch is not the cheapest breakfast/brunch restaurant with entrees costing around $13 – $18. However, the taste and portions of the food are okay in my opinion. I would recommend this location for families for breakfast or brunch. Read my review on De Dutch Coal Harbour here. 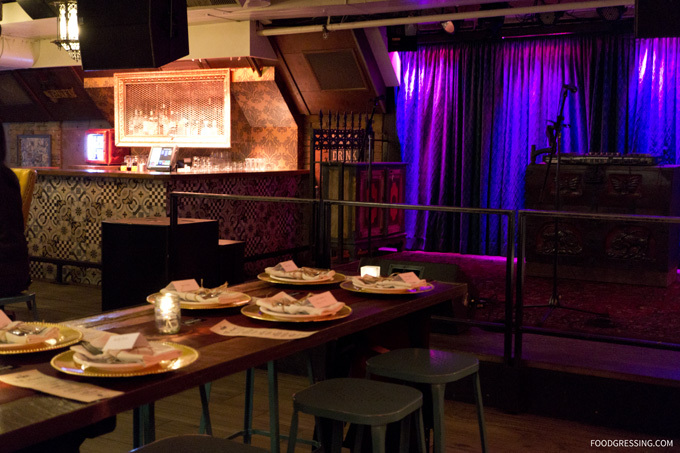 For Easter Brunch this year, we decided to go to Reflect Social Dining + Lounge again. Reflect is located inside the Hilton Metrotown at Crystal Mall. The brunch was not held inside the restaurant this year, but rather in the Crystal Ballroom to accommodate a larger number of people. We had a positive experience last Easter from dining at Reflect and we were looking forward to another good one. 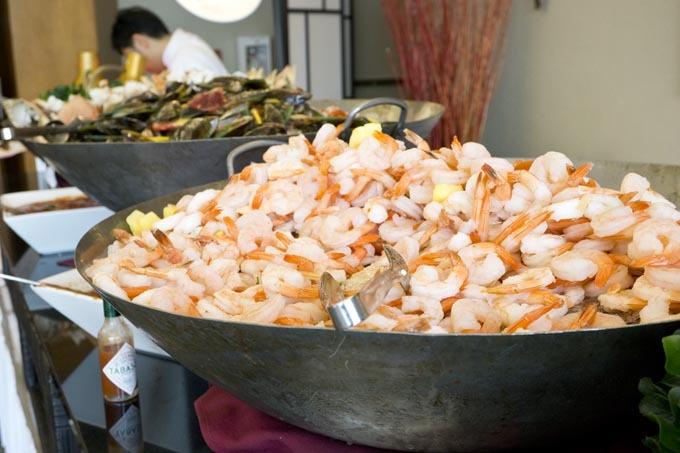 The price per adult was $32.95, which is less expensive than the Easter buffets in Downtown Vancouver. There were two seatings: 10:30 am and 1 pm. I made the reservation via Opentable for the later seating and they called me a few days before to confirm the reservation. Parking is available within Crystal Mall parking lot and there is no charge. 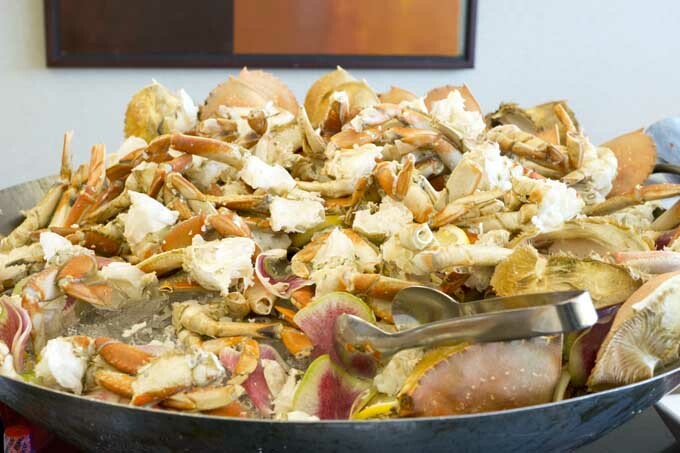 Their Easter Brunch menu had mimosas, made-to-order eggs Benedict, roast beef, seafood and desserts (of course!). 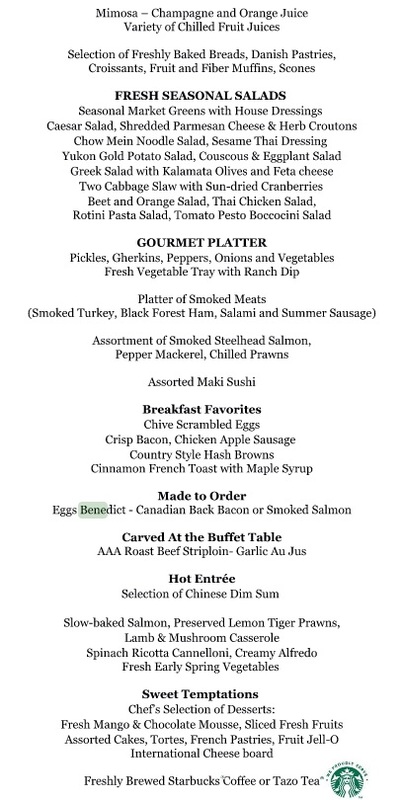 Here is a screenshot of their Easter Brunch menu. 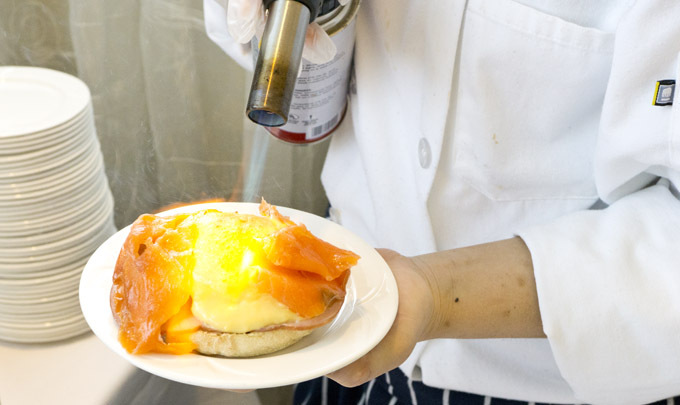 Some highlights of the brunch included the delicious made-to-order eggs benedict with smoked salmon. For the waffle-lover, there was no shortage of waffles. 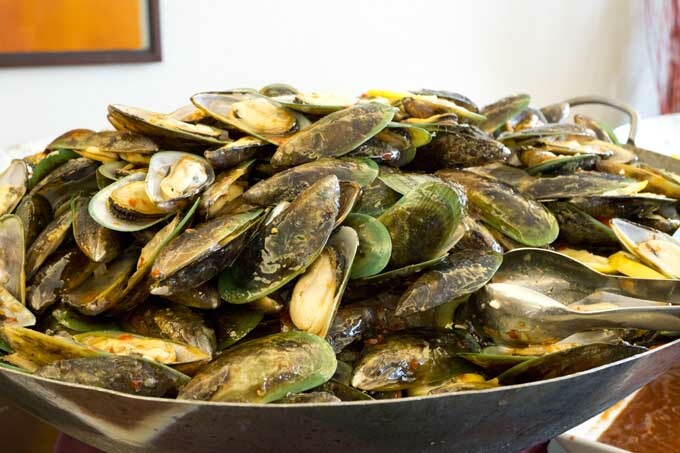 Oyster, crab-legs, mussels and prawns were part of the seafood bar. 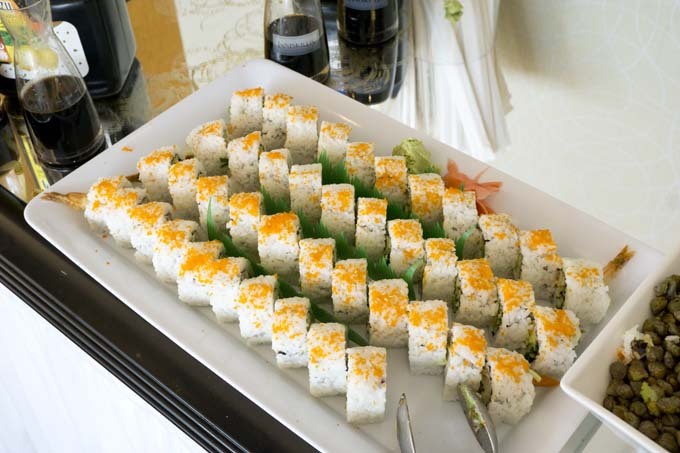 The sushi station had assorted rolls. The sushi was not the best compared to a really good sushi restaurants in Vancouver, but still okay. 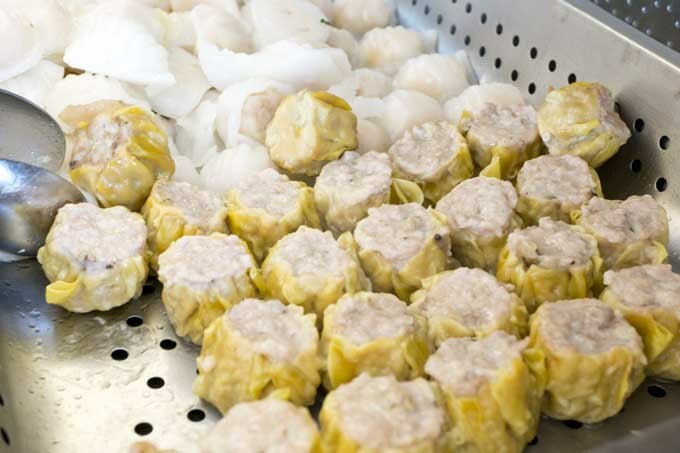 If you fancied some dim sum, there were har gow and shu mai. A pretty good selection of seasonal salads. 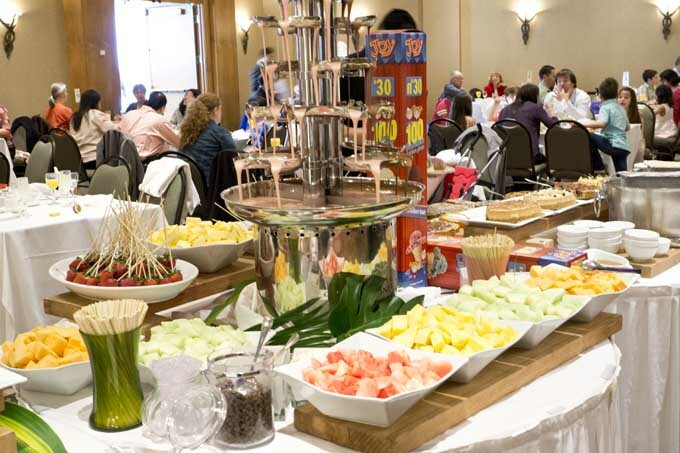 People enjoyed the fondue fountain with fresh fruit. 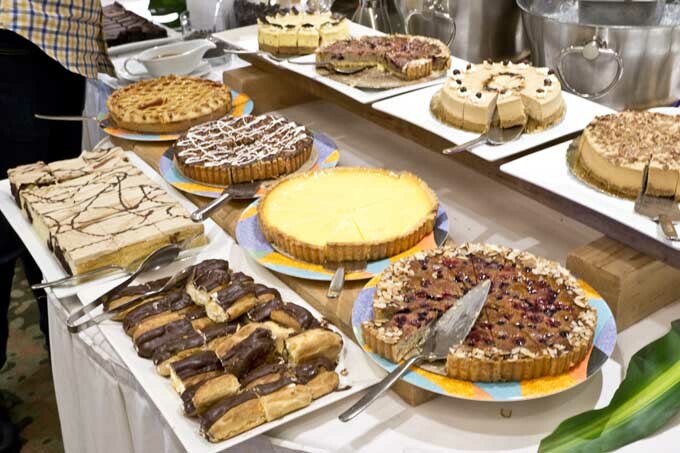 The dessert table was well-stocked with assorted cakes, tortes, fresh pastries and gelato. The Easter brunch was very family-friendly. They even had an entertainer make animal balloons and had a colouring contest. A DJ was on-site to provide entertainment music. My only disappointment was that the brunch was not at the restaurant. The Crystal Ballroom was a typical ballroom which was dark and had no natural lighting. There were a variety of tables set up including banquet, long and small tables. 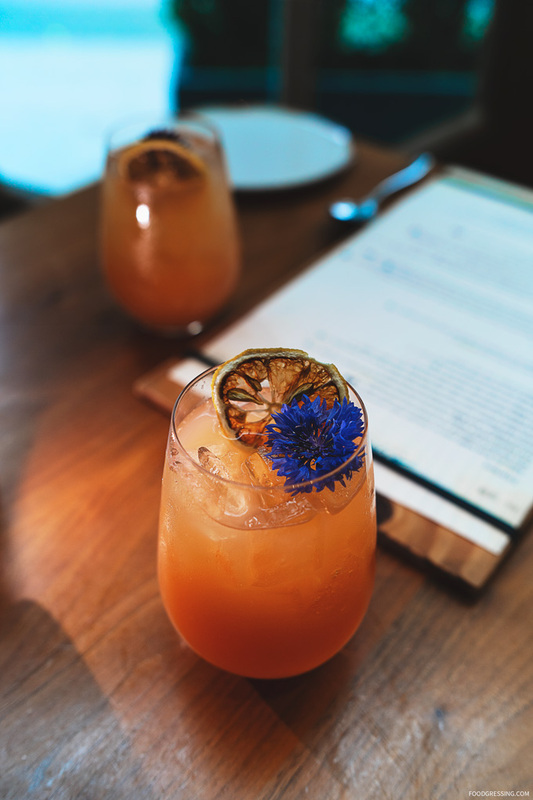 The restaurant has a far more beautiful, comfortable and modern interior, but logistically it would not be able to accommodate the demand for Easter brunch. Over time, piles of dirty dishes accumulated on tables from people who had left. I guess the staff either could not keep up with cleaning up quickly or they were waiting to do the cleaning when everyone had left. Either way, it seemed a bit off putting to look at unfortunately since I stayed closer to the end of the dining time. 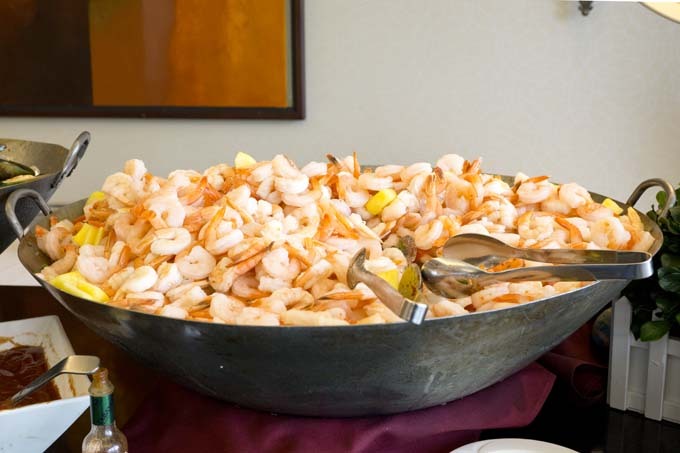 The quality and selection of food was decent in general and in line with what you would expect from a good hotel buffet for $33 per person. The servers were also attentive and the staff attending the food areas were friendly. We had a positive experience overall and I would recommend the buffet if you would like a nice hotel brunch in the Metrotown area. This week was a week of giving back while dining out. 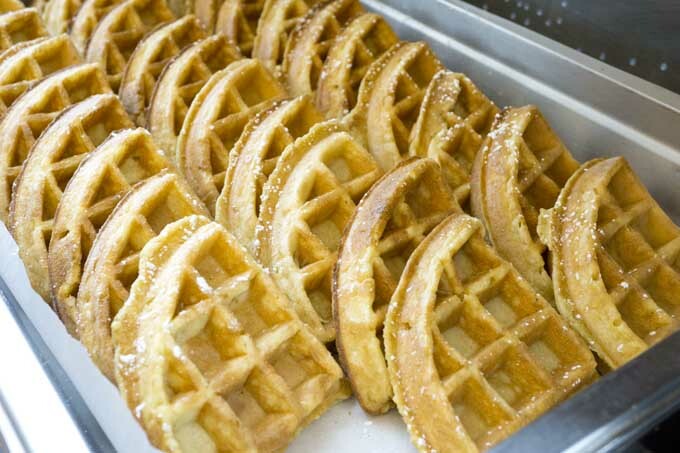 Wednesday, March 25 was International Waffle Day. I enjoyed waffles at Cafe Medina where every waffle sold helped provide a meal for someone in need. 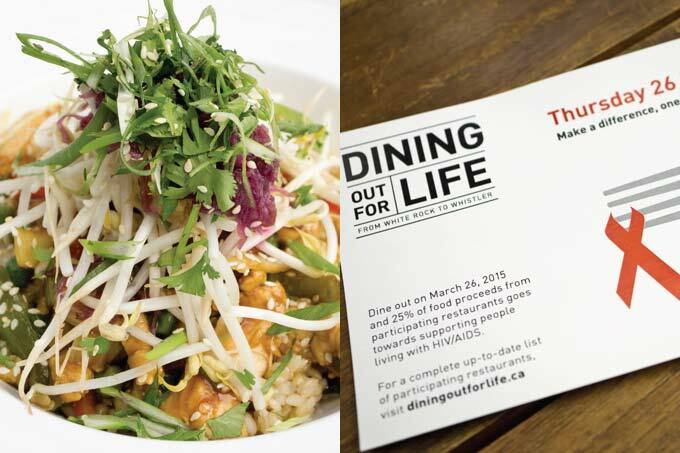 The next day, March 26 was Dining Out for Life. Participating restaurants donated 25% of their food sales to help men, women and children in our communities living with HIV/AIDS. Cactus Club in Yaletown was one of the participating restaurants, and my husband and I headed there for our Dining Out for Life dinner. It was surprisingly warm and dry that evening so we decided to dine on the patio. The interior of the restaurant is pretty dark, and I definitely preferred being outside. 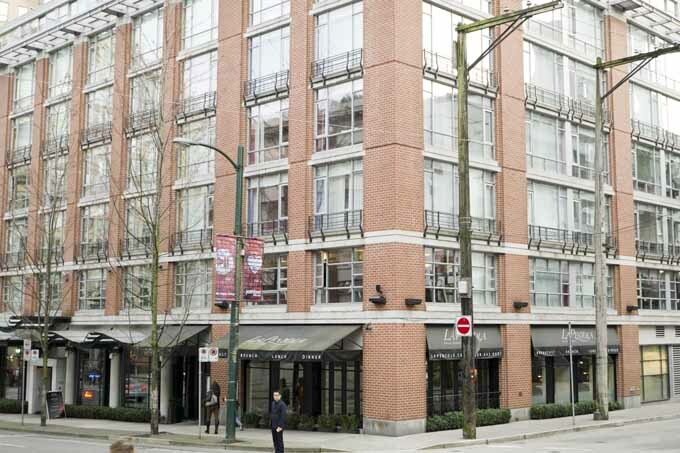 The Cactus Club Yaletown patio is quite large and overlooking Davie and Hamilton streets. The Rob Feenie signature bbq duck clubhouse seemed interesting so we ordered it. It had peking duck, roasted chicken, san daniele prosciutto, and pecan fruit bread. 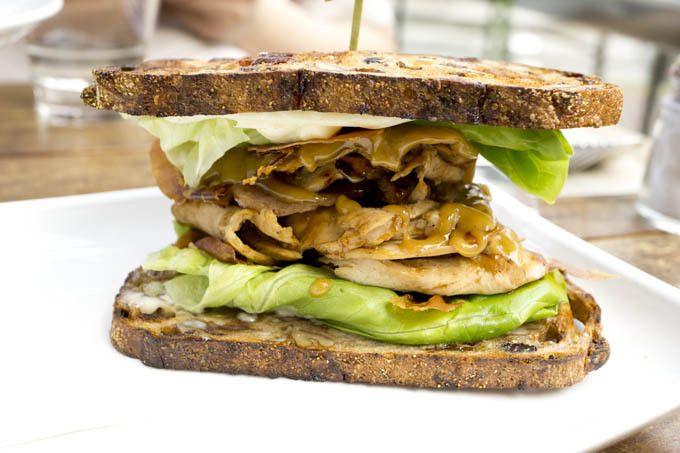 The pecan fruit bread was nicely toasted and added an overall sweet taste to the sandwich. When it was served to our table, the sandwich looked pretty stacked! 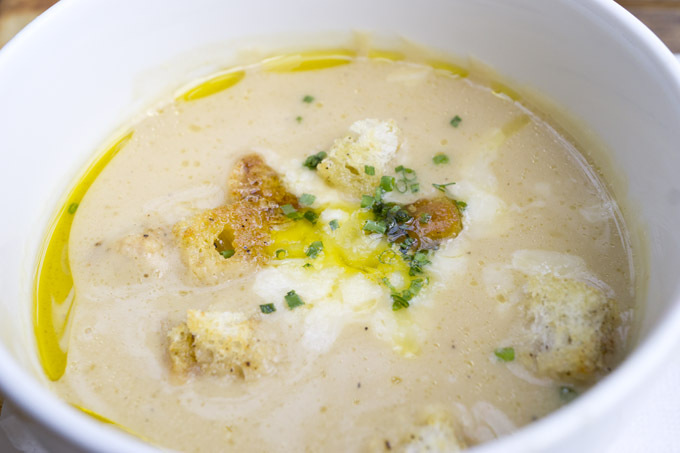 The clubhouse came with a bowl of celeriac soup made with aged white cheddar, black pepper croutons, and extra virgin olive oil. 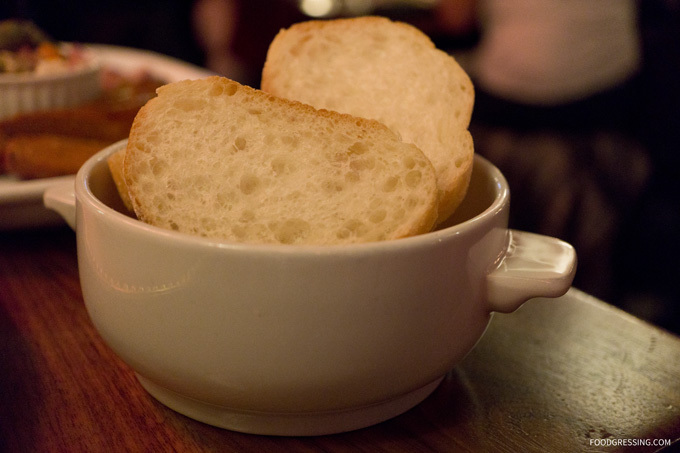 The soup was served with a grissini bread stick. The soup was creamy and thick; it complemented the sweetness of the clubhouse very well. 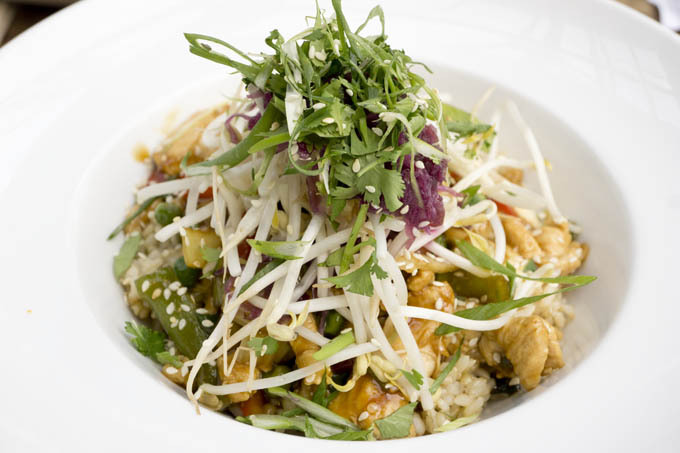 We also had the teriyaki chicken rice bowl. It had bell peppers, broccoli, braised red cabbage, bean sprouts, and spicy yogurt. The dish was a nice mix of sweet and salty and had lots of flavour. I did not feel like the yogurt was spicy at all. The dish was overall a moist and tender meal. 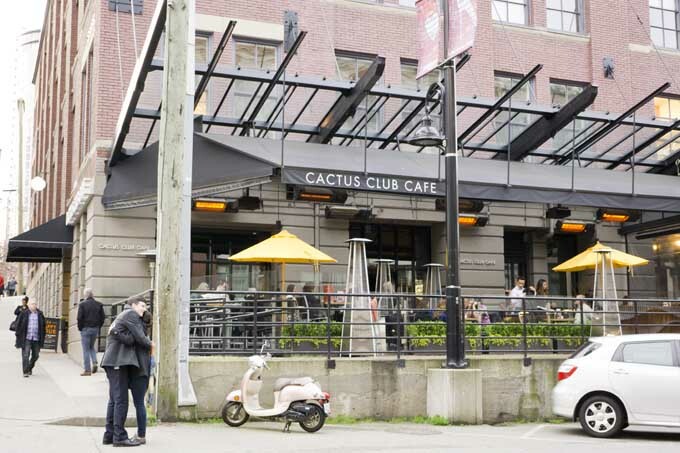 The service at Cactus Club was solid and the overall dining experience was pleasant. As usual, the Cactus Club servers were well-groomed and are generally attractive. 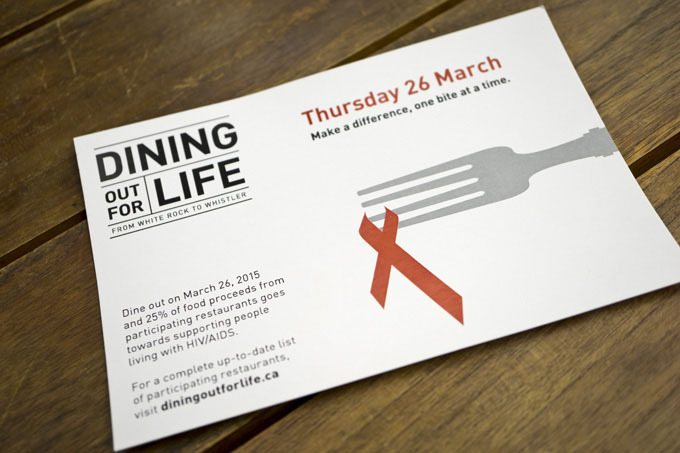 Did you participate in Dining Out For Life? What great eats did you have?